Provide comfort for the family of Virginia Burger with a meaningful gesture of sympathy. 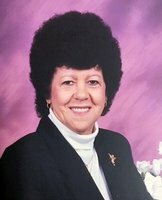 Virginia Ann Burger, 83, Independence, MO passed away March 16, 2019. Mass of Christian Burial will be at 10:30 am, Friday , March 22 at St. Mark’s Catholic Church, 3736 S. Lee's Summit Rd, Independence, MO 64055; entombment at Mt. Olivet Mausoleum.. Mass will be preceded by visitation beginning at 9:00 am and the Rosary at 10:00 am at the church. The family requests contributions to the Alzheimer’s Association of Greater Kansas City, 4126, 3846 W 75th St, Prairie Village, KS 66208. Virginia was born July 24, 1935 in Centertown, MO and attended California High School. She was a member of St. Mark’s Parish since 1965 and was a member of Altar Society. She enjoyed riding horses and showed horses at the State Fair. She was an excellent cook and a country music fan. Most important in her life was Faith and Family. Virginia was preceded in death by brother Charles C. Hurst, Jr.; sister Ella Ponder and her husband Wayne and sister-in-law Catherine Hurst. She is survived by her husband of sixty-two years Jack Burger, of the home; son Jim Burger and wife Paula, Lee’s Summit, MO; daughters Linda Smothers and husband Greg, Trimble, MO; Teresa Pollock and husband Devin, Kansas City, MO; sister Myrene Hoellering and husband Paul, California, MO; brother Frank Hurst and wife Eldora, Meta, MO: sister-in-law Mary Ann Hurst, Jefferson City, MO: grandchildren Brian, David, Sarah, Steve, Kimberlea, Allison and Jack and seven great-grandchildren. To send flowers in memory of Virginia Ann Burger (Hurst), please visit our Heartfelt Sympathies Store. Rosary will follow at 10:00 am. Donations are being accepted for: Alzheimer's Association Heart of America Chapter. Consider providing a gift of comfort for the family of Virginia Burger by sending flowers. Provide comfort for the family of Virginia Ann Burger (Hurst) by sending flowers.